Protesters wave a Catalan pro-independence 'Estelada' flag as they gather at the Placa de la Universitat square in Barcelona during a general strike. BARCELONA - Spain was braced for further political upheaval Wednesday after Catalonia's leader said the region would declare independence "in a matter of days". Carles Puigdemont said his government would "act at the end of this week or the beginning of next", the Catalan regional leader told the BBC in an interview Tuesday. "We are going to declare independence 48 hours after all the official results are counted," Puigdemont said in the interview. His remarks came hours after Spain's King Felipe VI ratched up tensions by urging authorities to defend "constitutional order". Felipe's dramatic intervention late Tuesday aimed to calm Spain's deepest political crisis in decades, but risked further fanning resentment in the region. "With their irresponsible conduct they could put at risk the economic and social stability of Catalonia and all of Spain," he said. "It is the responsibility of the legitimate state powers to ensure constitutional order." But after Sunday's violence it was a delicate balancing act for a Spanish sovereign. People watching in a bar in Barcelona whistled and booed after the king's speech. "It is a real disgrace... Far from solving anything it has added fuel to the fire," said Domingo Gutierrez, a 61-year-old trucker. "He did not say a word about the people who were injured... I have never been pro-independence, my parents are from Andalucia. But now I am more for independence than anyone, thanks to people like that." Police unions and political experts warned that Spain's government risks losing control of the north eastern region. It is considered Spain's worst political crisis since an attempted military coup in 1981. That was defused by Felipe's father, King Juan Carlos I, also in a stern television appearance. Hundreds of thousands of protesters in Barcelona on Tuesday yelled for national security forces to get out of the region, branding them "occupation forces". In Sunday's disturbances, Puigdemont said nearly 900 people had received medical attention, though local authorities confirmed a total of 92 injured. Angry protesters rallied outside Catalan hotels where state security forces were lodged, police groups said on Tuesday. Spanish authorities "are losing control, it is clear", Javier Perez Royo, a constitutional law professor at the University of Seville, told AFP. A rich industrial region of 7.5 million people, Catalonia accounts for a fifth of Spain's economy. "The government of Catalonia is pushing the population to the abyss and inciting rebellion in the streets," Spain's Interior Minister Juan Ignacio Zoido said on Tuesday. He said his government would take "all measures necessary to stop acts of harassment". Puigdemont's regional government claimed that 2.26 million people took part in the poll, or just over 42 percent of the electorate -- but the vote was held without regular electoral lists or observers. Puigdemont has said he will present the results to the region's parliament, where separatist lawmakers hold a majority -- a step towards a possible declaration of independence. 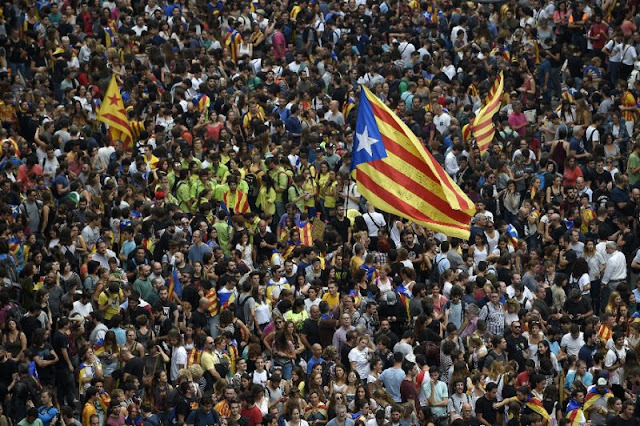 The regional government said 90 percent of those who voted backed independence, but polls indicate Catalans are split. Puigdemont has called for international mediation in the crisis. The European Union's executive commission has voiced concern. The European Parliament was scheduled to debate the Catalonia crisis on Wednesday. Spain was braced for further political upheaval Wednesday after Catalonia's leader said the region would declare independence "in a matter of days".